Groups competing at WGI Regional and Power Regional events will receive participant wristband passes for all performing members plus ten (10) additional passes for prelims, semi-finals and finals. Two of the 10 additional passes will provide front-side seating at Regional events. Also available for purchase is a PLUS Pass. This must be purchased at the time of registration. Groups competing at World Championships will receive participant wristband passes for all performing members plus ten (10) additional passes. Wristbands will allow admission to all prelims, semi-finals, A Class Finals and Open Class Finals performances. • Also available for purchase at the time of registration is a PLUS Pass. A World Championships PLUS Pass provides seven (7) additional wristband passes at a fee of $215.00. • World Class groups performing in Finals will receive the same number of “Finalists” wristband passes that they received at check-in. • Groups are allowed to pre-order Non-Finalist Backside tickets for the weekend of their group’s performances only. For groups competing in World Championships, World Class Non-Finalist Backside tickets will be available for pre-order. The Primary, Secondary and Financial contacts listed will be notified when the pre-order link is available. Only the Primary or Financial contact may pre-order tickets. The link will be located on the director’s only website by selecting the “World Champs Non-Finalist Backside Seats” tab. Each group is eligible to pre-order the number of performing members plus ten (10) and an additional seven (7) if a PLUS Pass was previously purchased. • Pre-orders are filled on a first come, first serve basis until seats are no longer available. • Groups are financially responsible for all reserved backside seats unless your group is a World Class finalist, in which case your pre-ordered tickets will be voided. • Orders may not be Cancelled. 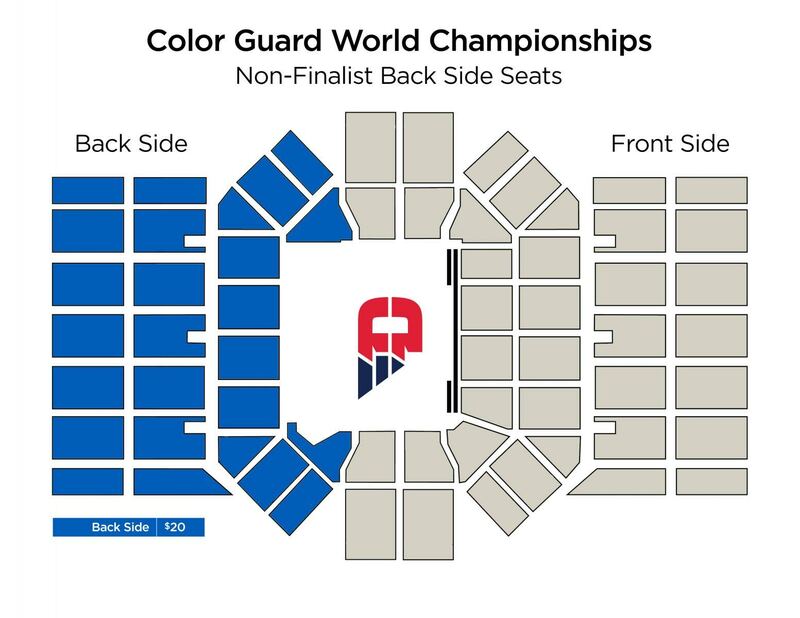 • All Non-Finalist Backside Seat Tickets can be picked-up at World Championships headquarters located at UD Arena, Boesch Lounge, Friday evening or Saturday morning. • Tickets are for your group’s use only and cannot be resold. Penalty for reselling tickets is disqualification from current World Championships as well as the following WGI competitive season.